1H. Liu and A. Peters are with the University of Bristol, Bristol BS8 1TH, UK. 2M. Garrich is with the Dipartimento di Elettronica e Telecomunicazioni, Politecnico di Torino, Torino, Italy. He is also with CPqD—Centro de Pesquisa e Desenvolvimento em Telecomunicacoes, Campinas, Brazil. 3G. Zervas is with the Optical Networks Group, University College London, London WC1E 6BT, UK. A function programmable optical network has been recently proposed to enhance the flexibility of an optical transport based on architecture-on-demand (AoD). The flexible synthesis of optical node architectures provided by AoD enables an open and disaggregated optical layer thanks to the available deep programmability. However, previous studies have focused on how to synthesize a single node out of switching function blocks, thus neglecting the optical signal-to-noise ratio (OSNR) impact, power imbalance effects due to the diverse set of devices traversed per input–output configuration, and network-wide implications. In this work, we present an optical network-wide function synthesis (ONetFuS), which is an algorithm to compose AoD nodes that consider placement and configuration of both switches and amplifiers. ONeFuS minimizes OSNR degradation and deviation across channels and offers enhanced power balance performance. Moreover, ONetFuS addresses multiple-node scenarios to investigate cascading, transmission distance, and networking effects. We compare the number of optical cross-connections computed by our proposal against solutions in the literature. 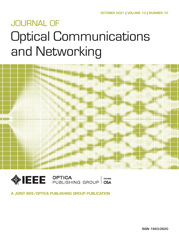 Results in network scenarios, including the number of components, power balance, OSNR variations, and OSNR penalty reductions, prove the suitability of our proposed ONetFuS for open and functional programmable optical networks.